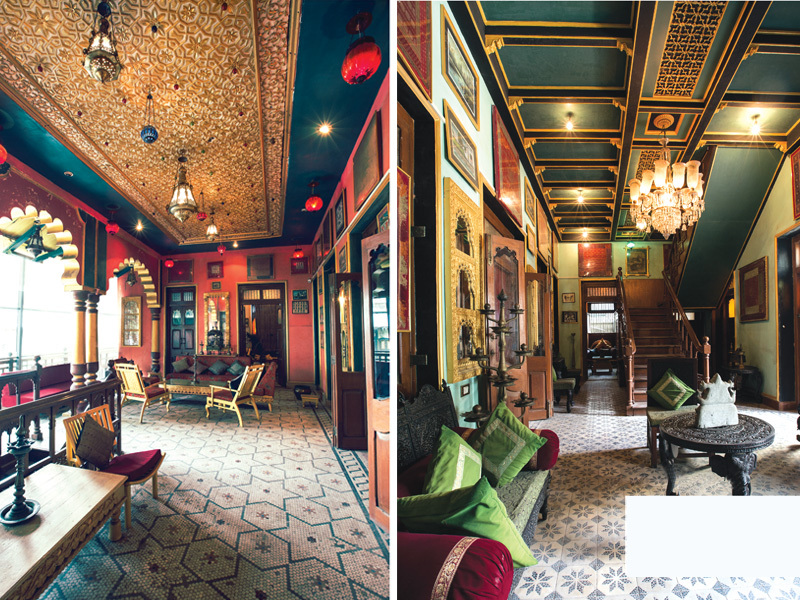 Set within the walled city of Ahmedabad, the Hutheesing haveli has welcomed many heads of princely states, industrialists, political leaders, and global head honchos, including our very well respected Prime Minister, Narendra Modi. A September morning when I visited this historic city, I had the honour and privilege of visiting the grand Hutheesing haveli, resplendent in its myriad rich ancient traditions, dating back to the early 18th century. 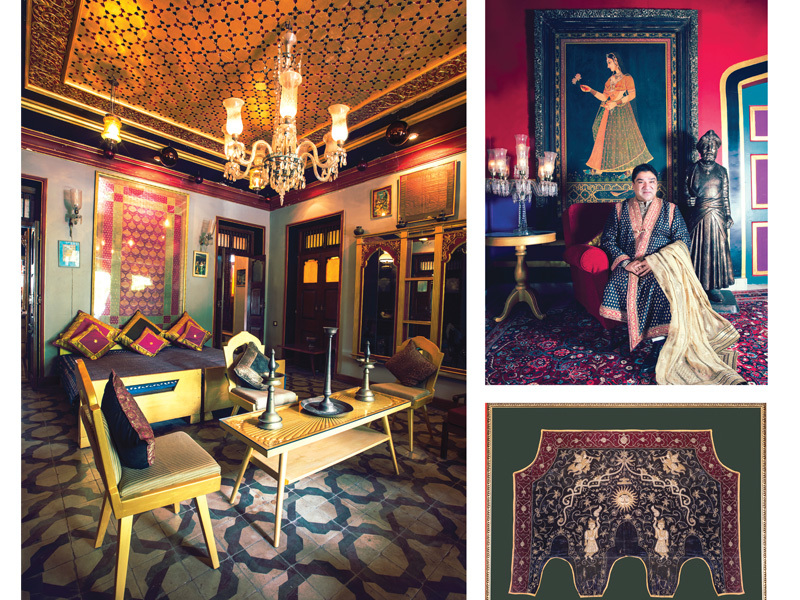 This dream space is home to costume collector and craft revivalist, Umang Hutheesing, who lovingly takes us through every nuance of the haveli. Commissioned way back by Umang’s great-grandfather Shri Purushottambhai, this haveli had, over the years, totally gone to seed. It was only six years ago that Umang decided to take on the task of reconstructing it, having a huge attachment to the haveli that was once home to his esteemed ancestors. The work started, employing craftsmen and artisans trained in specific areas of the rich artistic traditions that Ahmedabad is known for. It thus became a veritable museum, preserving rich art from the Vedic times, with each area depicting the lives of the family of merchant, through the varied cycles of time. We started the haveli tour by visiting the puja room and paying obeisance to the gods and goddesses that preside at the haveli. The tour continued at the Kamal Kund Chowk, situated on the ground floor and is also the reception area overlooked by the terraces of the haveli. The splendid Lotus courtyard was used for classical dance performances and haveli sangeets, brought alive the bygone era of darbars. A majestic arched entrance houses the statue of Lord Ganesha, protecting the haveli as in all traditional Indian households. The design on the floors of the chowk resembles a water tank filled with blossomed lotus flowers. We walk up to the first floor, into the Surya Darbar which is the grand reception hall. Painted in red and yellow colours that symbolise fire and sunlight, the room is reflective of a positive energy and an end to darkness and ignorance. Umang’s in-depth knowledge of the ancient scriptures, namely the Rig Veda, is well depicted in the Nav-Graha Audience Hall. The hall indeed represents the theme of ‘atthiti devo bhava’ that stands for the guest is supreme. Using the nine cosmic deities to form the Nav Graha, embellished with Suryamukhi flowers, this hall is painted in red and green, symbolising fertility and longevity. The walls are adorned with zardozi pichwais and several statues of gods and goddesses. We then proceeded towards the Padmalakshmi Dining Room. Painted in pink (the colour of the lotus flower of Goddess Lakshmi), the room is decorated with brocade pichwais depicting Lord Krishna playing the flute while his cows feed their calves, symbolic of the dining room area. Catching my attention was the blue room, which I learnt was Narayan Sabha, the room of leisure. Representing Narayan and his leisurely activities, this room is painted in blue and is made complete witha ceiling that depicts cosmic waves controlled by the omnipotent. With a pichwai that depicts Garuda, the cosmic vehicle, and a granite statue of Narayan, this room is symbolic of cosmic leisure. Moving on, I came across what are called the Matru Chhaya and Pitru Bhava, the feminine and masculine antechambers. The ceiling of the feminine chamber was resplendent with lotus flowers, the walls painted deep pink, representing the heart of Goddess Lakshmi, where a mother nurtures her children, bestowing them with love and blessings. On the wall was a painting of the 14 dreams that Lord Mahavir’s mother had before he was born, symbolising a mother’s desire for her children to become evolved human beings. The walls of the Pitru Bhava were deep blue, representing the heart of Narayan, where the father lets his children imbibe wisdom and honour family traditions coming down from generations. In this fairyland I climbed up Vidya Sagar, which may be a mere staircase for many. But for Umang, it is a way of denoting the desire to attain moksha and higher knowledge. On the second floor was the Vaikunth Vichar, with a white and gold ceiling. This hall symbolised purity and wealth. We further moved to the morning lounge called Utsav – a symbol of birth, harvest and prosperity. The evening salon or the family room, Sharad Poonam flows between two levels. The downstairs is dedicated to Surya Dev, for activities of the day, while upstairs is dedicated to Chandra Ma, for those of the night. This room is painted in midnight blue and embellished with small mirrors. It is a sight to behold, with Nathdwara pichwais depicting Sharad Poornima, the full moon night with Krishna cavorting with the gopis. The Chandra Prakash ceiling with a silver centre and golden waves, depicted the effect a full moon casts on the tide. I was further taken to the resting feminine and masculine chambers. The Padma Vibushan feminine suite, where Lakshmi rests at dusk and rises at dawn on the lotus, is painted in lavender and soft pink and green. This was Umang’s way of offering peaceful sleep and gentle awakening to the female occupants. The Shesh Naag, or rather the masculine suite, was based on the mythological tale where Narayan rested on the Shesh Naag. 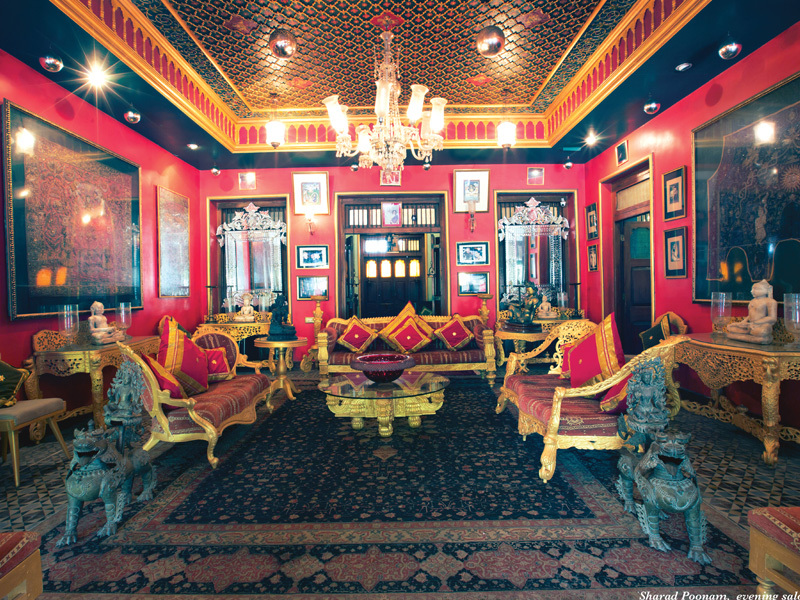 Painted in grey and black with infusion of red and gold, this room conveyed Narayan’s regalia and his mighty valour at its best. The dressing room indeed took me by storm. The Swarana Mukut, as Umang called it, were small atelier rooms depicting the moonlight with gold brocade canopies, symbolising the golden crowns of Lakshmi and Narayan. Fitted with large mirrors and reclining sofas, these vanity rooms were used for introspection, adornment and meditation. The Naag Narayan Vanity masculine bathroom is black in colour, symbolising the seven-headed serpent as he entwines around Narayan to protect his modesty during the time of his vanity. The bathroom is pink, depicting the lotus flower closing around Lakshmi to protect her modesty during the time of her vanity.